Around 150 students, staff and Cambridge residents gathered on King’s Parade today at an emergency rally in support of Palestine, following recent attacks in Gaza. 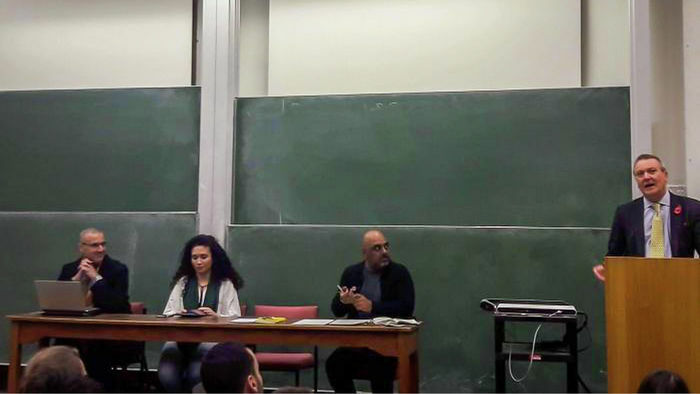 The Cambridge University Israel Society launched a petition urging the CUSU BME and Women’s campaigns to remove their endorsements of the rally. During the rally, a minute’s silence was held for the victims in Gaza, while their names were read aloud to the crowd. Activists spoke in solidarity with Palestinians, and similar events were held across the country today. Speakers included representatives from Cambridge UCU, and the city’s local Palestinian solidarity group. Dr Anne Alexander, a prominent member of the Cambridge branch of the University and College Union (UCU), urged those at the rally to “send a clear message to the University” that the killing of Palestinians was “not something we want our university as an institution to be supporting in any way whatsoever”. The emergency rally was called yesterday, as a response to reports that Gaza had experienced its most severe day of violence since 2014, with Israeli troops killing 58 people and injuring 2,700 others, according to Palestinian officials. Protests from Palestinians in the past few weeks, marking the 70th anniversary of the mass exodus of Palestinian Arabs, have resulted in at least a further 40 deaths. In a statement, Daniel Ohrenstein, Cambridge University Israel Society president, said that while they support students’ right to protest, he found it “disgraceful” that the CUSU BME and Women’s campaigns were endorsing the event. He added that the Israel Society was “very disappointed to be putting pressure on two organisations [the BME and Women’s campaigns] that are doing fantastic work in their fields”, but that they had “missed the mark” with the protest. Protests are expected to continue in Gaza, and may lead to more action in Cambridge. At the event today, speakers also urged for similar demonstrations during Trump’s UK visit in July. The CUSU Women’s Campaign and BME Campaign have been contacted for comment.